If you are a client of Purple Trading, you may have received this email, and if you are using the STP account you should read this carefully. 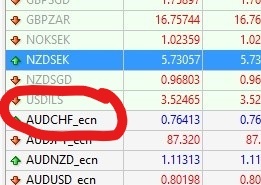 In order to clearly distinguish the STP and ECN account types on the MT4 platform, you will always see symbols with the appropriate suffix according to your account type, therefore for STP accounts you may find “_stp” suffix, eg “EURUSD_stp “. The platform will still be showing symbols without a suffix, such as “EURUSD”, however they can no longer be used for trading. Therefore we are repeating the notification: from 10 September 2017, there will be no non-suffix symbols available for trading, which will affect all STP accounts. Therefore, please use only symbols with appropriate suffixes depending on the type of your trading account, for STP accounts with suffix “EURUSD_stp” etc. You can find the type of your account in your PurpleZone, but you can easily identify the active trading symbols on the platform in the left column of the Market Watch, the appropriate symbols will not be not grayed out. Image: The _stp symbol is not yet available in the menu. The menu will appear during the weekend, here is an example of a symbol with the suffix _ecn. Open positions will not be affected in given deadline, the correct names of symbols on STP accounts will be changed automatically during the weekend between 9-10 September. ECN accounts are not affected. However, if you are using an automated trading strategies (ATS) and you have the STP account, you need to edit the symbol and its suffix during that weekend directly in your ATS code! This change also applies to Demo accounts and PAMM accounts for providing managed investment services. If you use these symbols, you need to change these symbols in MT4, otherwise you will not be able to operate the trading strategies: they may not close open positions, open new pending orders or open new orders. The MT4 log will then accumulate an error message that trades cannot be executed. How should I proceed exactly? It is therefore necessary to view all the symbols in the chart window and replace them with symbols with the suffix _stp during the weekend. To change the symbol you can drag the “EURUSD_stp” to the “EURUSD” chart for example. The symbol will be replaced, but the strategy, including its settings, will remain the same. The change should not take more than a few minutes. After making this change, I recommend following MT4 traffic to make sure everything goes well.